The most anticipated Wichita golf event of the year is nearing: the 2018 Wichita Open runs June 14-24 with competition rounds on June 21-24 at Crestview Country Club. Grounds passes are $10 per day per person with all proceeds going to a local charity of your choice. One-day passes to the 17thHole VIP experience are $75 per person. Spectator parking is $6 and available at Beechcraft, where air-conditioned shuttle vans transport guests to the course. 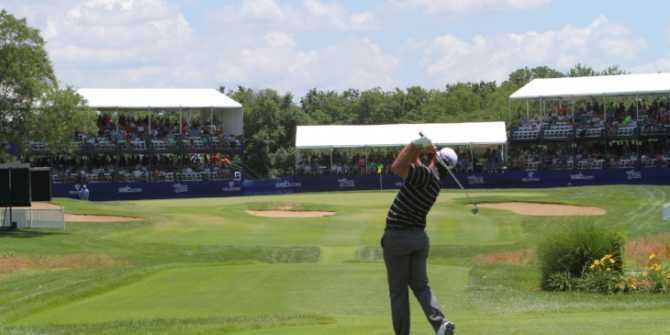 Earlier this year, the golf tournament returned to its roots by changing its name from the Air Capital Classic back to the Wichita Open. More than 40,000 spectators and some of the best golfers in the world vying to play on the PGA TOUR attend the annual event on Crestview Country Club’s North Course, a challenging course with many 4- to 5-par holes. The most famous feature for spectators is the Coors Light Corner at the 17th Hole, featuring VIP chalets and a festive atmosphere. The 17th Hole chalets draw 3,000 to 4,000 spectators a day. The Wichita Open stands as one of the Web.com Tour&apos;s original four events dating back to the inaugural 1990 season. Organizers announced in January 2018 a five-year contract extension with the PGA TOUR and host Crestview Country Club, which has served as host venue for the event over the past 17 years. The Wichita Open has produced four winners who have gone on to claim major championships, including Tom Lehman (1990), David Duval (1993), David Toms (1995) and Jason Dufner (2001). The tournament&apos;s 2017 edition was won by 2016 NCAA Champion Aaron Wise, who is currently a rookie on the PGA TOUR and won his first PGA TOUR event at the Byron Nelson Classic in Dallas in May 2018. At the end of 2017, the Wichita Open was honored with the Outstanding Achievement award from the PGA TOUR for being one of the strongest events on the Web.com Tour schedule, a favorite among players and for continuing to grow each year.